As you know, I love my culture. it’s rich in history, tradition and beautiful colours and flavours. 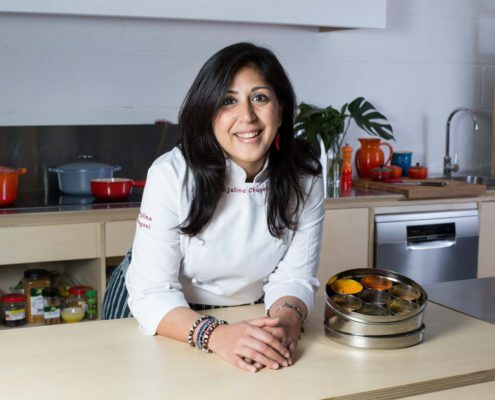 Indian cuisine took a while to “take off” here in Spain, which to me is surprising as there are so many similarities, especially referring to flavours of southern Spain. We use fresh local ingredients, pride ourselves on vegetables, and the Spanish have been using cumin and saffron for years. A few misconceptions about Indian food. firstly, Indian food is from the country, India. And within this vast land, there are so many states, and each one has its own regional cuisine. This has nothing to do with religion. Which is why time and time again, I find myself correcting my friends, students and fellow cooks here in Barcelona. it is not Cocina hindu… Hinduism is the main religion in India yes. However, the food is generally called Indian food. The other “myth” is that Indian food is hot and overly spicy. It can be. There are certain curries that pride themselves on the unbearable heat. But traditional Indian food is mild in heat, strong on spice variants and calming for the soul. Anjalina offers several bespoke cooking classes based on the beautiful world of Indian cuisine. From 1-12 people, hands on cooking classes where you can experience cooking in an Indian kitchen, using authentic spices and ingredients. The masterclasses vary according to the season and ingredients will also vary according to the produce that’s in season at the time. Check the classes and dates available currently via the button below. Anjalina takes you on a route through her spice cabinet, and special spice box, revealing the secrets of Indian traditional cooking. Recipes from traditional Indian homes and kitchens. Have fun learning to make different Indian flat breads including the famous naan, accompanied with a curry and a yoghurt sauce. A variety of vegetarian ingredients, beautifully spiced, forming the elements of this naturally colourful Indian version of the famous Buddha bowl. Traditional and aromatic curries, from different regions of India, all with distinct flavours. Anjalina shows you how easy they are to put together! Fresh vibrant recipes, incorporating spices and Asian flavours, perfect for summer months and easy to prepare and take away! 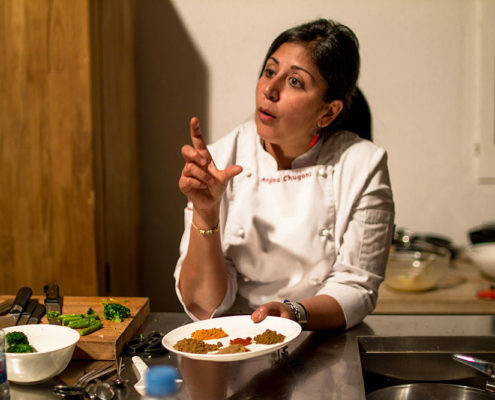 Anjalina teaches at various schools in Barcelona: La Patente, Cookiteca, Tierra Veritas, Born To Cook, Espai Boisa. Here is a list of upcoming course dates with links to book your class with her. This is subject to change.